(Nanowerk News) NASA's Hubble Space Telescope has been given the go-ahead to conduct an intensive search for a suitable outer solar system object that the New Horizons (NH) spacecraft could visit after the probe streaks though the Pluto system in July 2015. Hubble observations will begin in July and are expected to conclude in August. Assuming a suitable target is found at the completion of the survey and some follow-up observations are made later in the year, if NASA approves, the New Horizon's trajectory can be modified in the fall of 2015 to rendezvous with the target Kuiper Belt object (KBO) three to four years later. The Kuiper Belt is a debris field of icy bodies left over from the solar system's formation 4.6 billion years ago. Though the belt was hypothesized in a 1951 science paper by astronomer Gerard Kuiper, no Kuiper Belt objects were found until the early 1990s. So far over 1,000 KBOs have been cataloged, though it's hypothesized many more KBOs exist. The approval for additional observing time for the needle-in-a-haystack search is based on the analysis of a set of pilot observations obtained with the Space Telescope Science Institute (STScI) director's discretionary time on Hubble. After a swift and intensive data analysis of approximately 200 Hubble images, the NH team met the pilot program criterion of finding a minimum of two KBOs. 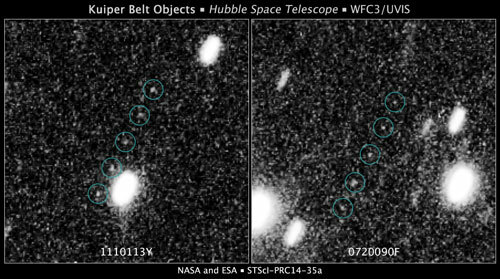 "Once again the Hubble Space Telescope has demonstrated the ability to explore the universe in new and unexpected ways," said John Grunsfeld, associate administrator for the Science Mission Directorate at NASA Headquarters in Washington, D.C. "Hubble science is at its best when it works in concert with other NASA missions and ground-based observatories." It will be many weeks before the team can establish whether either of these pilot-program KBOs is a suitable target for New Horizons to visit, but their discovery provides sufficient evidence that a wider search to be executed with Hubble will find an optimum object. "I am delighted that our initial investment of Hubble time paid off. We are looking forward see if the team can find a suitable KBO that New Horizons might be able to visit after its fly-by of Pluto," said STScI director Matt Mountain. In early June, Hubble's Time Allocation Committee awarded time for a full search with the requirement that its implementation be contingent on the success of the pilot survey. From June 16 to June 26, the New Horizons team used Hubble to perform a preliminary search to see how abundant small Kuiper Belt objects are in the vast outer rim of our solar system. Hubble looked at 20 areas of the sky to identify any small KBOs. The team analyzed each of pilot program images with software tools that sped up the KBO identification process. Hubble's sharp vision and unique sensitivity allowed very faint KBOs to be identified as they drifted against the far more distant background stars, objects that had previously eluded searches by some of the world's largest ground-based telescopes.